→ Incomplete means that horses with only one copy of the variant (SW/n) will show a less pronounced phenotype than horses with two copies of the variant (SW/SW). Irregular pattern, quite may be variable in appearance. Horses usually have a wide blaze, often wider on the lower part of the face. Face-white may be associated with blue eyes, white stockings and small white areas on the belly. 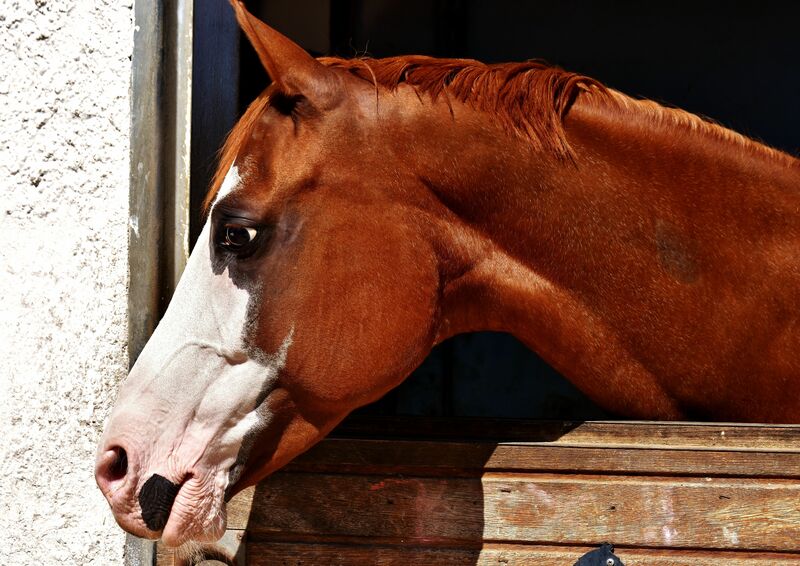 The most common Splashed White mutations are difficult to tell apart by looking: either genetic testing or (in Quarter horses) pedigree analysis are required. Combination of two different variants possible – SW1/SW2 and SW1/SW3 horses are known. Two of the known four variants are associated with deafness. May enhance other patterns (e.g. Tobiano) → higher amount of white in the pattern. n/n No Splashed White mutation. SW/n The horse has one copy of the SW-variant → strongly variable pattern. Often only blaze and stockings and/or small spots on belly. Blue eyes possible. SW/SW The horse has two copies of the SW-variant → Increased amount of white in pattern. Variable appearance, sometimes with completely white coat or medicine hat, especially if combined with another white spotting mutation. Blue eyes possible. One more SW variant was identified in a single American Standardbred foal. * SW2 and SW3 are believed to result in early abortion of homozygous foals since no homozygous genotypes has yet been recorded. Hauswirth, R., Jude, R., Haase, B., Bellone, R.R., Archer, S., Holl, H., Brooks, S.A., Tozaki, T., Penedo, M.C., Rieder, S., Leeb, T.: Novel variants in the KIT and PAX3 genes in horses with white-spotted coat colour phenotypes. Anim Genet 44:763-5, 2013. Pubmed reference: 23659293. Doi: 10.1111/age.12057. Hauswirth, R., Haase, B., Blatter, M., Brooks, S.A., Burger, D., Drögemüller, C., Gerber, V., Henke, D., Janda, J., Jude, R., Magdesian, K.G., Matthews, J.M., Poncet, P.A., Svansson, V., Tozaki, T., Wilkinson-White, L., Penedo, M.C., Rieder, S., Leeb, T.: Mutations in MITF and PAX3 cause „splashed white“ and other white spotting phenotypes in horses. PLoS Genet 8(4):e1002653, 2012. Pubmed reference: 22511888. Doi: 10.1371/journal.pgen.1002653. Extensive white on the lower part of the face is often caused by Splashed White. Splashed White may also occur in combination with other patterns. 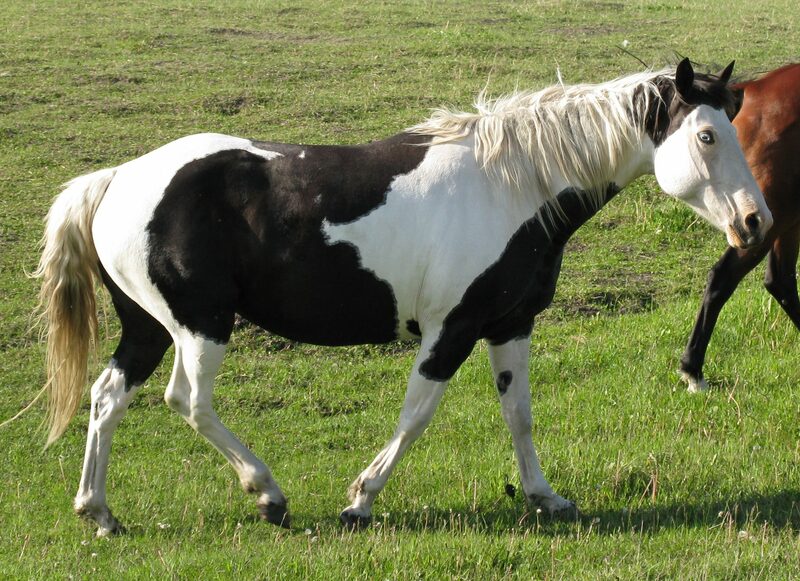 The horse shown in this picture likely has a Splashed White variant giving the white face and legs, as well as the Tobiano pattern adding white to the rest of the body. The exact genotype can only be determinded through genetic testing.